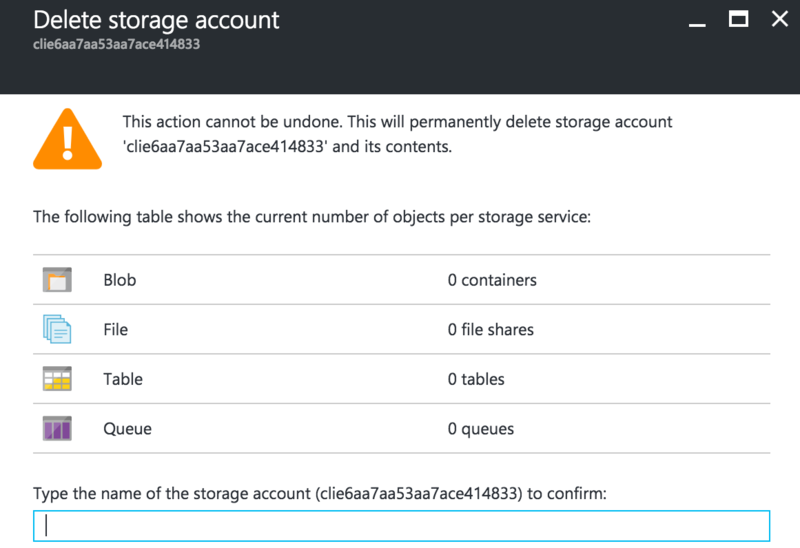 When trying to delete Azure Resource Group in the Azure Portal I get an error pointing to a Storage Account which could not be deleted. Currently I have two such undeletable, empty storage accounts - one of which remains for over 72 hours. Is there anything I can do to delete this Storage Account? Afaik, this could happen when you delete the Virtual Machine, but there is a disk associated to it, an it creates an artifact under the disk tab. When working with Resource Manager (ARM) virtual machines the disks are not seen in the classic portal. So it possibly can be a disk underneath a ARM, if all the articles about Storage Account troubleshooting aren't helpful, you can contact Azure support. AFAIK It's a common error. Your vhd is in this storage account, that's why you can't remove it, without delete the vhd. Azure RecoveryServiceVault can't be removed?